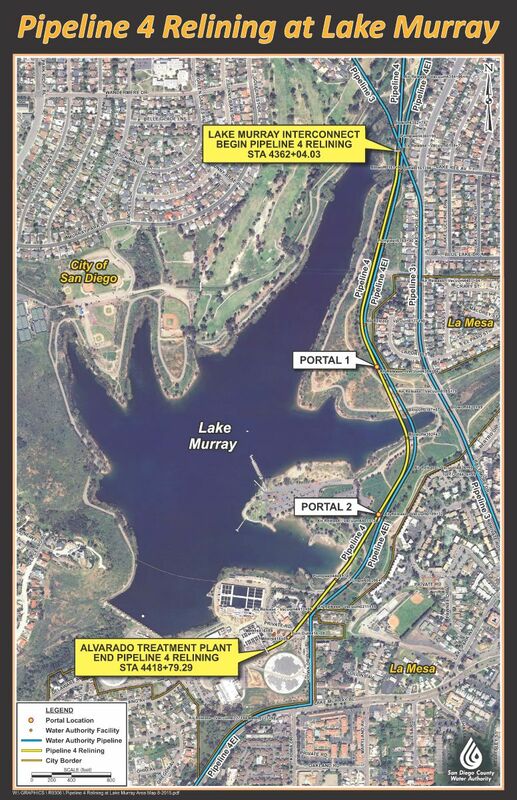 The Pipeline Relining at Lake Murray Project relined approximately 5,400 feet of Pipeline 4 from the northern part of Lake Murray to the city of San Diego's Alvarado Water Treatment Plant. The work also included decommissioning of the Water Authority's Alvarado Hydroelectric Facility. This section of Pipeline 4 was not relined during previous relining projects because it was necessary to keep this section of pipe active to deliver untreated water to the city's Alvarado Water Treatment Plant. Construction crews conducted most of the work underground, inside the pipe. The work did not interrupt water service to nearby homes and businesses. The pipe was accessed by excavating 45-foot areas called portals. Once excavated, the existing pipe was accessed and relining materials, including steel liners, were installed. Portals were surrounded by temporary wooden sound walls, where needed, to ease noise impacts to residents, comply with environmental regulations, and for security and safety precautions. Construction access and delivery of materials occured via a city of San Diego dirt maintenance road that provided a direct connection from Lake Shore Drive to the staging area and work sites. Additional access to the work sites occured from the south at the Kiowa Drive into the parking lot area of the Lake Murray Reservoir. Existing Water Authority and city of San Diego access roads and a portion of the city's paved Lake Murray perimeter trail were used by construction crews to travel between the work areas. The paved trail around the lake remained open during construction while some dirt access roads were closed to the public near the work areas. Signage was placed at all trail closures. To learn more about pipeline relining projects, please visit the Pipeline Relining webpage at www.sdcwa.org/pipeline-relining. For more information, please call the 24-hour toll-free project information line at (877) 682-9283, Ext. 7005 or email CIPinfo@sdcwa.org. A representative from the project team will return your call within one business day.